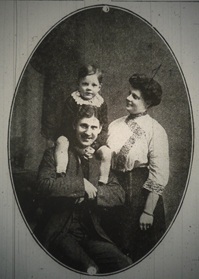 Mr and Mrs Arthur Dixon and their son Stanley were returning to Oldham for a five week visit. Mr Dixon was a commercial traveller and latterly an agent in New Zealand for Messrs Hirst Bros and Co Ltd, wholesale jewellers of Roscoe Street, Oldham. They had left New Zealand on 26 March 1915, and made their way to New York via Honolulu, Vancouver, and San Francisco. 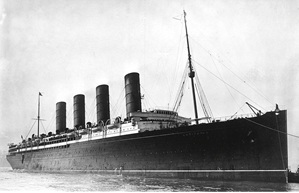 The Lusitania sailed shortly after noon on 1 May 1915. On board were 291 passengers in saloon or first class; 601 including a large number of young children in 2nd or cabin class; and only 373 in 3rd class, making a total of 1265 with a crew of 694 of which only 45 were seamen. We sailed on the Saturday and we were about a couple of hours late because of a lot of people coming off the other boat to ours at the last minute. I don’t think they were half careful enough on our boat. They never examined people’s baggage coming aboard, nor saw what was going aboard at all. We might have had anything on board. I do not think it was right to take the quantity of ammunition aboard. I was told by an officer that we had 500 cases of ammunition on board, not in the holds but in the cabins, hidden away in different parts of the ship. There were no guns on the ship. And, there are a lot of German boats interred in the harbours all round there, and there are scores of spies. We passed the New York, which sailed before we did, twice on the journey, but she seemed to be taking a different route. She had her name and the words ‘America Line’ in big letters all along each side. We flew the British flag all the time whenever we flew the flag at all. I was on deck when the torpedo struck us, and my husband and boy were below at lunch. Some of the passengers saw the torpedo coming, at a distance of about 300 yards away, and I heard them call out ‘My God! There’s a torpedo!’ and other remarks like that. Two gentlemen who had been together all the way across noticed it and one of them turning round to speak to the other noticed that he had disappeared. He had dashed straight away down to the purser and got from him all his valuables. His dead body was recovered afterwards and his friend, who was saved, and who I was told, was his partner in business in America, received a parcel containing a lot of valuable rings and other jewellery and over £800 in money. The first torpedo struck the Lusitania in the forward part of the starboard side. For a moment everybody was too stunned to move. A great lot of water shot up into the air and came down on the deck, and I was drenched with it and struck by pieces of falling wreckage, as I was sitting on the deck at the door of the saloon on the port side. Immediately the vessel was struck she gave a lurch and tilted to the starboard side. After a moment everybody rushed for the boats, which had been slung out a long time before in readiness for anything. I ran to the top of the stairs and my husband and boy came to me. I said; ‘Oh, we’re mined.’ We though at first it was a mine. Well, we could not stay in the boat as it would certainly have been sunk, and my husband helped to pull us out, and we had simply to fight our way out. There was nobody to lower the boats properly, and somebody let go one end first without the other, and most of the people in it were thrown out into the water. We got back on the deck, and my husband said he must try and get some lifebelts. He went below for some and he got one each and a spare one, four. As he was coming up the stairs again with them several of the crew rushed at him and tried to tear them from him. They were very rough men, whoever they were; I don’t know whether they were English men or what, but they were all black as if they worked in the coal. However he fought them off and got past them, and on the way to us a little boy stopped him and said; ‘will you give me one of those?’ and he put one on him and then dashed to us and fastened one round me and one round Stanley, and then one round himself. Then he called out ‘jump’ and we jumped into the water just as the ship was going down. He had hold of the boy when we jumped. I never saw them again. I went down and down in the water but then after a while I began to come up and when I got to the surface I cold not get my head out of the water on account of the quantity of wreckage of all sorts which was floating on the water. I had a dreadful struggle before I could get my head free, but at last I managed to scrape the pieces of wood and so on away with my hands and I was able to get my head out, and when I did I looked around and the ship had absolutely gone. There was not a sign to be seen of her. All around were hundreds of people struggling and screaming in the water, and the boats were quite a long way off, and going away from us. We could not see anything of any submarine, in fact I never saw it, though other passengers said they did. I was in the water for four hours. I looked round for my husband and Stanley, but I could not see them. Something hard hit me on the arm, and I grabbed at it, and I found it was the top of a packing case, and I stuck to it and never left hold of it again until I was saved. Nobody came near me for about three quarters of an hour, when an old gentleman came drifting by. He had hold of a bit of a pole in on hand, and was swimming slowly. He was so kind and helpful, as much as he could be. When he reached me he said: “There is a raft over there, and I will try and push you along with it”-and he did too. He managed to push me along to the raft, and he called to them: There is a lady here can you manage to take her on board, but they called back No we’re full up already. He said only take the woman you don’t need to take me. But they would not take me on and we had to let go the raft. A few minutes afterwards the old gentleman got so exhausted that he said he would have to let go but he had been so good to me and so helpful that I believed I must do all I could for him, so I got hold of the sleeve of his coat across the piece of wood and we held on to each other that way with the wood between us, and it helped us for a long time, but every little wave bruised my arm against a pin in the wood which stuck out and it made me so sore and numb that I could scarcely keep my grip. Every few minutes I got cramp, first in one hand then in the other, then in my legs or my arm. The old gentleman seemed to get very weak and he climbed sort of on to the wood and lay on his back for a while, but after another little time he seemed to go mad all of a sudden and took a sudden leap away into the water, and said he would swim. He could swim, I knew, and he left me and swam a few yards. It was only a few yards, and then he could do no more and I heard him give a groan and he disappeared. Then after that I was by myself for a long time, until a young man came drifting past. He had just a small piece of board to support him and he got hold of my wood and tried to get on it. I said he must not, but he could stick to it. He got hold and he kept asking me if I could see anything coming. I said No several times, but after a while I could see smoke and I told him so and asked him to hold on a bit longer. Then I could see six lots of smoke coming towards us. He said he did not think he could hold on any longer. I said ‘Do try and hold on a little longer’ and he kept on and we were both rescued, but I believe he died afterwards. It was the torpedo boat C25 which rescued us. The sailors were extremely kind to us. I shall never forget their kindness. They took off some of my wet clothes and rubbed me and wrapped me in flags and a blanket and a sailor’s greatcoat, they gave me hot tea. It was just after six o’clock when I was picked up. We scouted about for over half an hour, I should think, looking for others and I think they rescued 14 or 15 more…. We were landed at Queenstown at 20 minutes to 10 o’clock and taken to the Cunard office, and then to the Queens Hotel, but they were so full that I would have had to go in a bed with three others, but there was a Major W- there – don’t mention his name, for he and his wife were so kind but they would not have there names mentioned in the papers – and he said he would not hear of that, so he and his wife took us to their home, and I now believe that their kindness saved my life, for I fear I should have had pneumonia had I not been well looked after. 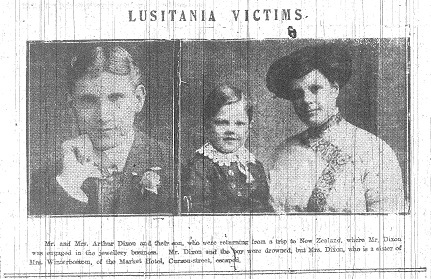 I am quite sure that the Lusitania was struck by two torpedoes. There would be a few minutes between the two because I and my boy had got into a boat and got out again before the second struck. After the second one the ship went over quite quickly. There was no time, and the water was up to my husband’s knees when he went for the lifebelts. There were lots of boats with people in and nobody to lower them, and it is not true that the discipline was good and that the crew behaved well. They behaved very badly; some of them at any rate. They were simply panic stricken. The captain was calling out that the ship was all right and that she would float, and that was the cause of so many of the first class passengers being lost because they were the nearest to him and they could hear him best and they were pacified by what he was saying. There were a great many of the crew saved and it seemed to be every man for himself round about where we were. All round us people were shouting and crying, and the women were the calmest of all. I tried to keep cool and it was only through doing so I was able to keep afloat and be saved, and I did my best to try and help everybody I could. I could hear people all around crying Help me, save me and O God and terrible cries and screams, but I kept my senses all through. An American doctor who attended me at Queenstown shook hands with me when I was leaving for Dublin, and he said; You are the bravest woman I ever met. This blog post was written by Dorothy Bintley from Oldham Local Studies and Archives. We live about a half hour drive from Cobh (Queenstown) in County Cork. There’s a very fine sculpture there as a memorial to the passengers of the Lusitania who lost their lives. It was very moving to read this eye-witness account. Thanks for sharing.